Posted on 30/01/2014 by Jayson	in Trading Thoughts. 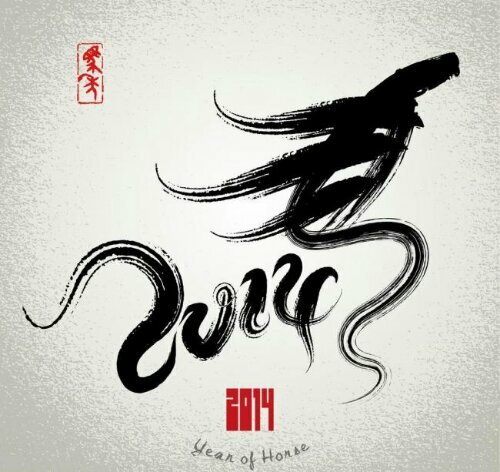 Wishing Everyone Good Health and Prosperous Lunar New Year ! Posted on 17/05/2013 by Jayson	in Trading Thoughts and tagged Hu Li Yang, Invest Fair 2013, Roger Montgomery. The Invest Fair for this year will be held in Aug 2013 at Suntec. I guess the organisers have not finalised the programme and at the moment, we only know that there are a few speakers. Among them are Roger Montgomery and Hu Li Yang. I have attended a talk by Roger Montgomery and I can say that he is a good speaker and is able to capture his audience well with his very good presentation. Roger has always been a fundamentalist with focus on value investing. As for Hu Li Yang, he is a famous speaker for the stock market in Asia and beyond. I have read his chinese books and his comments on TV. Hu Li Yang is being looked upon as the father of investment education in Taiwan. His talks are entertaining and he is always able to explain his financial concepts in a easy to undersand manner to the retail investors. Attending invest fair is good for people who just started out to gain more understaning in terms of investing, investment education. Bascially to gain exposure to the various instrutments. Sometimes you can get some good deals, just like Travel fair or the NATAS fair. Good to attend if you are a beginner or new to investment or if you would like to attend some free talks in your spare time. 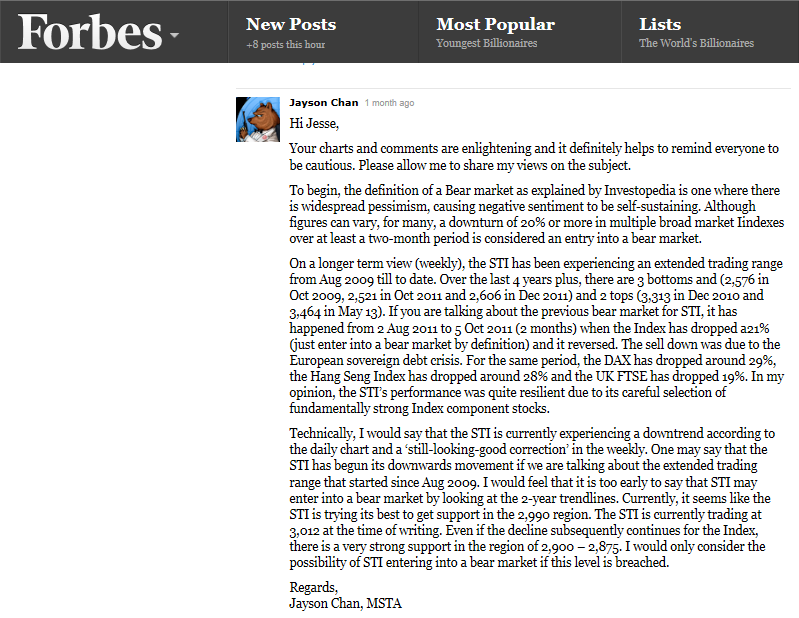 Posted on 02/05/2013 by Jayson	in Trading Thoughts and tagged STI. If you read the finance news below without looking at each market individually, I bet you will be confused. SINGAPORE, May 2 (Reuters) – Singapore shares touched a five-year high on Thursday, with DBS Group Holdings rising over 4 percent, its biggest daily gain in more than three years after posting a record profit for the first quarter. The Straits Times Index gained 0.9 percent to 3,401.00, while the MSCI’s broadest index of Asia-Pacific shares outside Japan was down 0.3 percent. Shares of DBS, Singapore’s biggest lender, jumped nearly 5 percent to S$17.59, the highest since May 2008. It was trading at S$17.51 at 0435 GMT, on course for its biggest daily climb since April 2010. DBS reported a record quarterly profit of S$950 million ($770.32 million), up 2 percent from a year earlier, boosted by annuity businesses and stronger capital market activities. 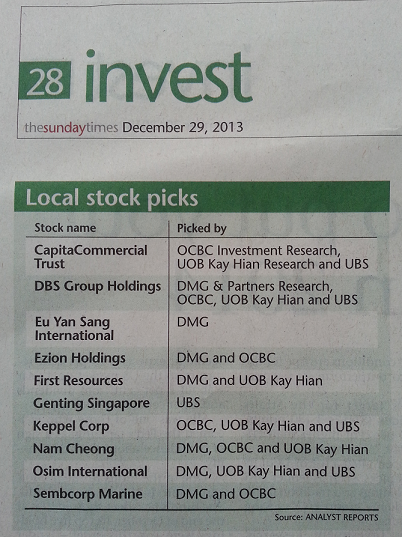 “DBS remains an Outperform and our high-conviction top pick in Singapore banking,” said CIMB Research. Shares of Genting Singapore Plc rose 4.23 percent to S$1.64, matching a peak in February, after casino operator Las Vegas Sands Corp posted better-than-expected first-quarter earnings on good results in Macau and Singapore. 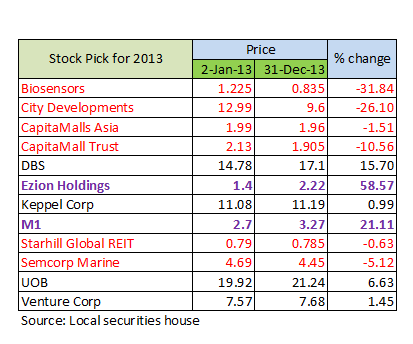 Genting Singapore is due to report its quarterly earnings after market close. AFP (2 May)- Asian markets slipped Thursday after US stocks tumbled on the back of weak employment and manufacturing data, as dealers eyed a policy meeting of the European Central Bank later in the day. Tokyo closed down 0.76 percent, or 105.31 points, at 13,649.04, Seoul fell 0.34 percent, or 6.74 points, to finish at 1,957.21, while Sydney ended 0.70 percent, or 36.2 points, lower at 5,130.0. Hong Kong fell 0.30 percent, or 68.71 points, to 22,668.30 while Shanghai was down 0.17 percent, or 3.79 points, at 2,174.12, a day after official data showed that manufacturing activity in China slowed last month. US markets fell Wednesday following the release of separate reports showing that job growth eased to its slowest level in seven months in April and that manufacturing activity had slowed sharply in the same month. The data came as the Federal Reserve gave a tepid economic outlook at the close of its two-day monetary policy meeting.